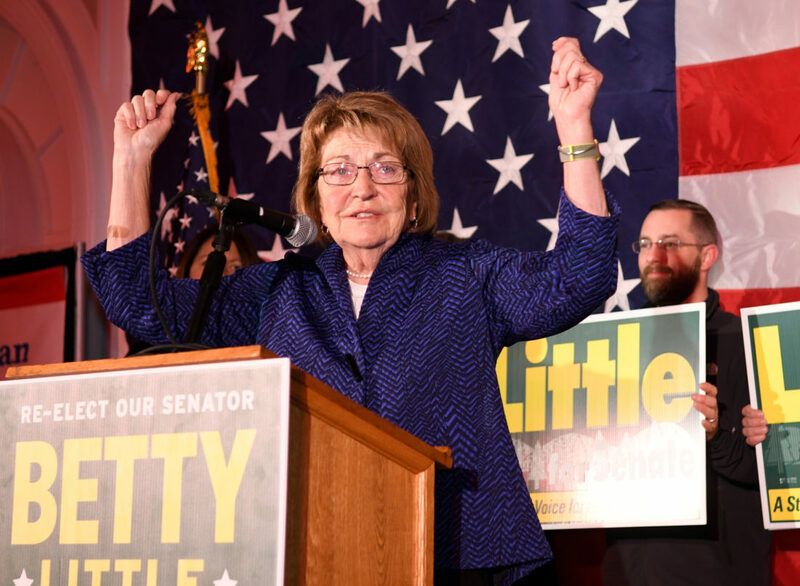 GLENS FALLS — State Sen. Betty Little was re-elected in a landslide for her ninth term Tuesday night, beating out Democratic challenger Emily Martz with 63.04 percent of the vote. Of the 173,331 active registered voters in New York’s 45th state Senate District, 94,713 turned out to vote. Of those, 59,710 voted to keep Little, a Republican from Queensbury, and 32,535 voted for Martz, a Democrat from Saranac Lake. The difference was 27,175 votes. That unofficial count does not include absentee ballots. Martz did best in Clinton County with 37.44 percent of the vote, and Little won most in Washington County with 68.95 percent. Essex County, Martz’s home county, voted for her 35.39 percent. Little also won Martz’s hometown, North Elba, 1,349 to 1,140.